Background: Resistance of antimalarial drugs to Plasmodium falciparum has become a major concern in malaria eradication. Although it is also affected by several socioeconomic factors, a new antiplasmodial agent is needed for a global malaria control program. Objective: In this study, we attempted to uncover the antiplasmodial properties of Garcinia celebica, an Indonesian medicinal plant, along with the responsible compound and its possible mechanism. Materials and Methods: The G. celebica leaves were ethanol extracted and fractionated based on their polarity using n-hexane, ethyl acetate, and water. The antiplasmodial activity was tested in vitro against chloroquine-resistant P. falciparum at 100 μg/ml for 72 h. The active compound of the most active ethyl acetate fraction was subsequently isolated using column chromatography and identified by nuclear magnetic resonance. Results: The IC50of (+)-catechin, the characterized compound, against P. falciparum was 198 μM in 24 h and experiment. The isolated catechin inhibited P. falciparum growth in both trophozoite and schizont stages. An additional experiment also suggests that the antiplasmodial property of catechin occurs through the induction of the oxidative stress to P. falciparum. Conclusion: This result shows that the potential of catechin and its antimalarial properties should be explored further. Abbreviations used: RBC: Red Blood Cells; IC50: Inhibition Concentrattino 50; MeOH: Methanol; RPMI: Roswell Park Memorial Institute; EI: Electron Ionization. Malaria is a deadly parasitic disease  and causes 2 million deaths annually worldwide. The biggest problem in its eradication is the growing resistance of Plasmodium falciparum, which may cause the most fatal form of malaria, to almost all of the currently available malarial drugs. Even with the current multidrug therapy program, P. falciparum has developed drug resistance against the latest antiplasmodial drug from the artemisinin family. Although malaria drug resistance is also affected by several socioeconomic factors, a new antiplasmodial agent is needed for a global malaria control program. From the hundreds of compounds tested for their antiplasmodial activities, plants and other natural compound are among the most promising.,, Quinine, the first antimalarial agent, and the next generation of antimalarial agents, including lapachol and artemisinin, have been isolated from plants., We previously reported the antiplasmodial activity of kaempferol-3-O-rhamnoside isolated from Schima wallichii leaves against chloroquine-resistant P. falciparum. Furthermore, our group also reported the antiplasmodial potential of several selenium compounds to induce apoptosis-like cell death in P. falciparum. One of the approaches to find a novel drug from plants is using plants that are consumed by particular groups. In recent years, we focused our research on discovering bioactive compounds from plants commonly consumed by nonhuman primates, as they are considered to be a promising source of products applicable for the management of human disease. In the present study, we focused on the exploration of the antiplasmodial activities of Garcinia celebica leaves, one of the plants that is consumed by nonhuman primates with anticancer potential. In our previous studies, we reported the anticancer potential of kaempferol-3-O-rhamnoside,, a compound that is isolated from the nonhuman primate-consumed plant S. wallichii, which also has antiplasmodial properties. Thus, in the present study, the antiplasmodial properties of G. celebica leaves were investigated, and their active compound was identified. G. celebica leaves were collected from Pangandaran Beach conservation area in West Java Province of Indonesia. The leaf of G. celebica was identified, and specimen also deposited in the Department of Biology, Faculty of Mathematics and Natural Sciences, Universitas Padjadjaran, Bandung, Indonesia. The powdered G. celebica leaves were extracted with 95% ethanol (3 times each for 24 h) at room temperature, and the solvent was evaporated under reduced pressure at 50°C to yield concentrated extracts. The extracts were further fractionated based on their polarity in a mixture of n- hexane-water (1:1) to produce hexane and water layers, and the water layer was further extracted with ethyl acetate to yield the ethyl acetate and water fractions. The crude extract, n-hexane, ethyl acetate, and water fractions were tested for their antiplasmodial properties against chloroquine-resistant P. falciparum. The ethyl acetate fraction, which was the most active fraction, was chromatographed on Wakogel C-200 (Wako Pure Chemical, Japan) with a mixture of n-hexane, ethyl acetate, and methanol with increased polarity. The active compound, for which the isolation was guided by Brine Shrimp Lethality Test, was purified using silica G-60 with sulfuric acid-ethanol (1:9) and identified by spectroscopy methods including ultraviolet and infrared spectrometry (UV-IR), nuclear magnetic resonance (NMR), and liquid chromatography–mass spectrometry (LC-MS). Chloroquine-resistant P. falciparum strain DD2 was grown asynchronously as described previously, in disposable culture dishes (Greiner, Frickenhausen, Germany) under a controlled atmosphere of 5% CO2 and 5% O2 at 37°C. The parasite was grown in RPMI-1640 medium (Sigma-Aldrich, St Louis, MO, USA) containing 10% type B or O human serum (the serum type showed no significant difference to parasite growth), 25 mM 4-(2-hydroxyethyl)-1-piperazineethanesulfonic acid (Wako, Osaka, Japan), 25 μg/ml gentamycin (Sigma-Aldrich, St. Louis, MO, USA), 25 mM sodium bicarbonate (Wako, Osaka, Japan), and human type O red blood cells (RBCs) to make a final 5% hematocrit mixture. The growth inhibitory effect of crude extract, ethyl acetate fraction, n-hexane fraction, and water fraction of G. celebica leaves was assessed by exposing P. falciparum to a medium containing 100 μg/ml of each extract and fraction. The growth inhibitory effect of the active compound isolated from the ethyl acetate fraction of G. celebica leaves was assessed in a medium containing 345 μM of the compound. An unsynchronized parasite culture with an initial parasitemia of 0.1% was used. The culture medium containing the extract was changed, and the number of parasitized RBCs (pRBCs) was counted every 24 h. The pRBCs were counted by making Giemsa-stained thin-smeared slides, and the number of pRBCs in 3000 RBCs was determined under a light microscope at 1000 times magnification. This experiment was terminated at 72 h. Each of the extracts was assessed in triplicate. Dimethyl sulfoxide was added to the culture medium to make a 0.0003% final concentration mixture as the untreated control. The pRBCs were synchronized by introducing 5% D-sorbitol into the culture for 15 min as reported elsewhere, and they were washed three times using RPMI and reintroduced into a similar culture condition as stated in the previous section of this report. This step was repeated after 12 h to produce a tightly synchronized culture. The parasite cultures at 2% parasitemia were moved into 24-well culture plates, and the culture solution containing the active compound of the ethyl acetate fraction of G. celebica leaves at concentrations of 0 (control), 34.5, 172.5, and 345 μM. The culture was incubated for 24 h at 37°C and then checked for growth. Once the majority of the parasites in the control well were formed into schizont, the plates were removed from the incubator, and thin-smeared Giemsa slides were made from each well. We counted the RBCs in the control well until we found fifty schizonts. The concentration-dependent antiplasmodial effects were evaluated by comparing the number of schizonts found in the same number of RBCs as counted from the control wells. This procedure was performed three times, and then the inhibition curve was made, and the IC50 was determined from the inhibition curve. The stage-specific antiplasmodial effect of the active compound at its IC50 concentration was evaluated with chloroquine diphosphate (CQ) used as a positive control. In brief, the pRBCs were tightly synchronized as described above, and the active compound was introduced into the culture. After 24 h, thin-smeared Giemsa slides were made, and the number of pRBCs in 3000 RBCs was determined under a light microscope at 1000 times of magnification. CQ (Wako, Osaka, Japan) diluted in milli-Q water was used as a positive control at its IC50 concentration of 370 nM. Each treatment group was made in triplicate, and the experiment was performed three times. Parasites at 2% parasitemia were prepared in 24-well culture plates containing either 0, 250, or 500 μM of ascorbic acid (Wako, Osaka, Japan) and treated with the active compounds at its IC50 concentration. The culture plates were incubated at 37°C for 24 h before the thin-smeared Giemsa slides were made for each well. The number of pRBCs in 3000 RBCs was determined under a light microscope at 1000 times of magnification. Each treatment group was made in triplicate, and the experiment was performed three times. Statistically significant differences were determined by Student's t-test. P < 0.05 was considered a statistically significant difference. Treatment with the G. celebica extract at the concentration of 100 μg/ml inhibited P. falciparum growth [Figure 1]. The extract was then fractionated based on polarity and using n-hexane, ethyl acetate, and water. The fractions were then individually applied to a P. falciparum culture at a concentration of 100 μg/ml each [Figure 1] and were found to inhibit P. falciparum growth. Due to its strong inhibition of P. falciparum growth, we then explored the ethyl acetate fraction for further antiplasmodial potential. Catechin was isolated from the leaves of G. celebica as a white yellowish crystalline solid. It had a molecular ion peak at m/z 290 in the EI mass spectrum, which indicated that this compound had a molecular formula of C15H14O6. This compound showed absorption bands at 220 and 275 nm (MeOH) in the UV spectrum, which indicated the possibility of the compound belonging to a flavan compound of the flavonoid group, and the IR spectrum has a broadband of approximately 3500–2800 cm −1 region corresponding to aliphatic and aromatic C-H and phenolic and alcoholic O-H stretching. A band appearing at 1600 cm −1 may be derived from aromatic C = C stretching, and no band of the carbonyl group was observed. The UV and IR characteristics suggested that the compound may be a flavan-3-ol derivative of the flavonoid group. As seen in [Figure 2], the 1H NMR spectrum of this compound showed signals at δ 2.73 (1H, dd, J = 2.6 and 16.9 Hz), 2.8 (1H, dd, J = 4.5 and 16.9 Hz), 4.18 (1H, m), and 4.82 (1H, br s), which are characteristic of the –CH2-CH-CH-O group of the flavanol skeleton. Furthermore, the 1H NMR spectrum revealed two signals at δ 5.91 (1H, d, J = 2.0 Hz) and δ 5.94 (1H, d, J = 2.0 Hz), which are attributed to two aromatic hydrogens of the A benzene ring and three signals at δ 6.75 (1H, d, J = 8.5 Hz), δ 6.80 (1H, dd, J = 2.0 and 8.5 Hz), and δ 6.97 (1H, d, J = 2.0 Hz), which were derived from those of the B benzene ring, with each of the rings termed the A- and B-rings on the left and right of the flavanol skeleton, respectively. The above data suggest that this compound is catechin. The 13 C NMR spectrum identified the presence of 15 carbons derived from 12 aromatic carbons appearing at δ 96.0, 96.5, 100.2, 115.4, 116.0, 119.5, 132.4, 145.9, 146.0, 157.8, 157.8, and 158.1 and three other carbons at δ 29.4, 67.6, and 80.0. The 1H and 13 C NMR data suggested that the compound was catechin [Figure 3], which was confirmed by comparison of its spectral data with those of reported (+)-catechin. The antiplasmodial effect of catechin was observed in P. falciparum culture at the concentration of 345 μM and for 72 h. The results shown in [Figure 4]a indicate that the antiplasmodial properties of catechin were dose dependent. 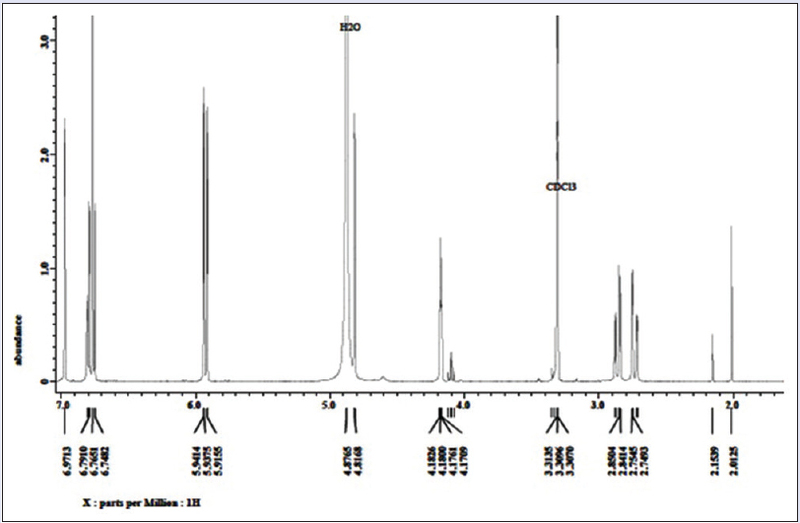 Subsequent analysis of the antiplasmodial activities against a P. falciparum culture using various concentrations (0, 34.5, 172, and 345 μM) of catechin for 24 h showed that the IC50 value of catechin was 198 μM [Figure 4]b. As seen in [Figure 5], the results of the stage-specific antiplasmodial experiment show that catechin at its IC50 concentration inhibited P. falciparum growth in both trophozoite and schizont developmental stages. Oxidative stress has been reported to play a major role in several antiplasmodial compounds.,, As seen in [Figure 6], the addition of ascorbic acid in a dose-dependent manner gradually decreased the antiplasmodial activity of catechin against P. falciparum. With the high prevalence of malaria cases, especially in tropical countries, the search for naturally occurring agents that may inhibit malaria parasite development is becoming an important objective for scientists. This study shows that G. celebica leaves, which were previously reported for their anticancer properties, possessed antiplasmodial properties against chloroquine-resistant P. falciparum. This result is similar to previous findings of nonhuman primate consumption of S. wallichii leaves  and a traditional West African medicinal plant, Cryptolepis sanguinolenta (Lindl.) Schltr (Periplocaceae), which were both reported to possess anticancer and antimalarial properties. G. celebica, also known as seashore mangosteen, is a medium-sized tree that can grow up to 30 m tall and has spread from Southeast Asia to Papua New Guinea in the east and eastern India to the west. It can be found in lowland forest near the sea and is also distributed in the inland forest up to 1200 m of altitude. In some areas, the trees are commercially and culturally planted for ornamental purposes, and its fruits, roots, and leaves are also ethnobotanically used for the treatment of itchiness and made into decoction for women after childbirth. 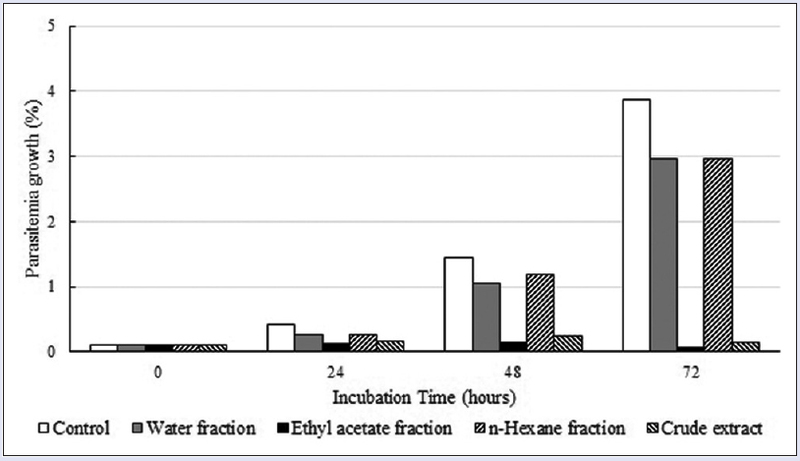 In this study, the ethyl acetate fraction of the G. celebica leaves extract showed antiplasmodial activities against P. falciparum culture, and it was as strong as those of the crude extract [Figure 1]. This suggests that the compound responsible for the antiplasmodial properties of G. celebica leaves may be contained in the ethyl acetate fraction. Therefore, we then explored this ethyl acetate fraction for its antiplasmodial potential. From the ethyl acetate fraction of G. celebica leaves and guided by Brine Shrimp Lethality Test as a simple biological test to guide pharmacologic activities, we isolated catechin as the active compound. 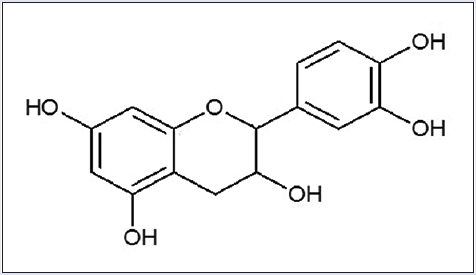 Catechin is a flavonoid widely reported for its anticancer potential.,, It has also been reported to reduce atherosclerotic lesions in a mouse model. Our results suggested that catechin also inhibits chloroquine-resistant P. falciparum growth in a time- and dose-dependent manner [Figure 4], with an IC50 concentration of 198 μM against chloroquine-resistant P. falciparum in a 24 h treatment. 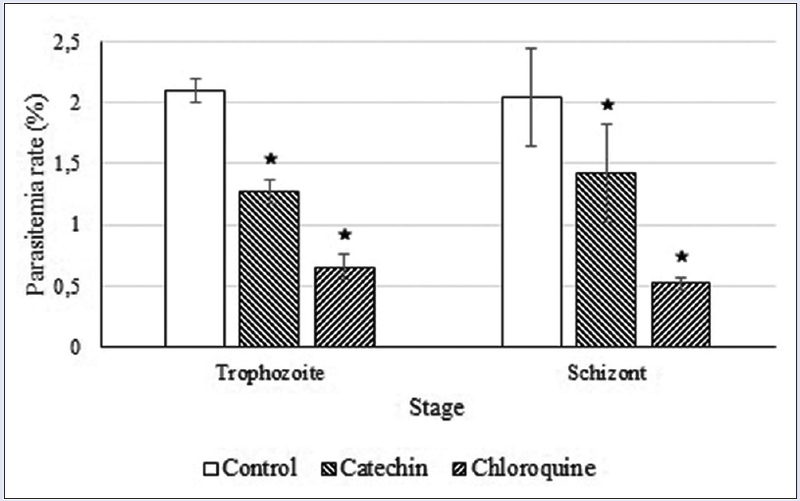 This study also suggested that the treatment of catechin significantly reduced parasitemia in both blood stages of P. falciparum, trophozoites and schizont, from the initial parasite generation [Figure 5]. The inhibition of P. falciparum growth in the trophozoites stage will inhibit their development to the schizont stage, whereas inhibition of the schizont stage will inhibit their rupture, which will release merozoites. These blood stages are responsible for the sequestration of P. falciparum that results in the major pathology of severe malaria, which is characterized by a fever cycle that embodies the clinical manifestations of malaria. Thus, the ability of catechin to inhibit both of the blood stages increases the probability of developing a new antimalarial compound that is effective in clearing the blood from merozoites and also prohibits the occurrence of rosette or severe forms of malaria. Plasmodium is highly susceptible to oxidative stress. Therefore, elevation of oxidative stress as a result of inhibition of any component of their oxidative stress and antioxidant defense system will lead to a redox imbalance. The redox system plays important roles for the survival of Plasmodium within the host and disturbing the redox balance will affect the survival of Plasmodium during intraerythrocytic stages. Furthermore, Goyal also suggested that identification of compounds that can disrupt the Plasmodium redox balance and consequently promote oxidative stress will be an effective approach in the development of novel antimalarial drugs. 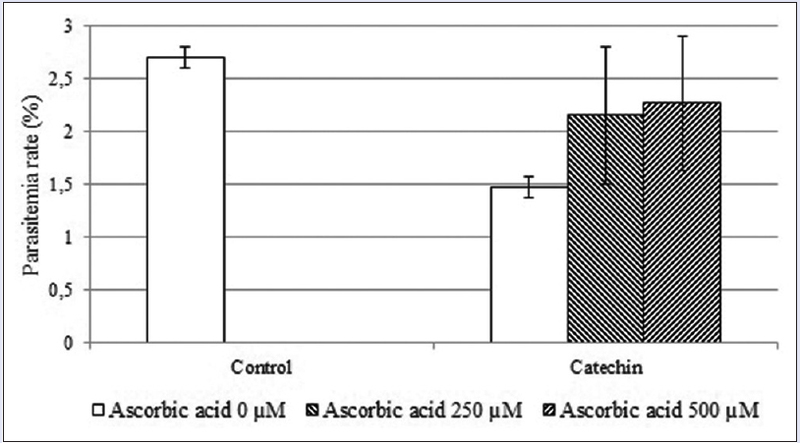 Interestingly, in this study, the addition of ascorbic acid as an antioxidant agent against the P. falciparum culture subsequently decreased the inhibition of catechin to P. falciparum growth. This suggests that the antiplasmodial properties of catechin against P. falciparum occur through the induction of oxidative stress. This study provides more evidence that products derived from plants hold potential in the treatment and prevention of human diseases. Thus, it is important to explore the pharmacological activities of plants and their active isolated compounds, including their exact mechanisms to provide valuable evidence for their possible application in human disease therapy and prevention. Although this is a preliminary study, the findings provide a basis for subsequent investigations of catechin as a potential compound for antimalarial drug development. This study was supported by the Directorate General of Higher Education of The Ministry of Education and Culture of Indonesia for RA (Grant-in-Aid for the International Research Collaborations and Publications) and a research grant from the Health Office of Teluk Bintuni Regency for EWS. We thank the Hokkaido Kushiro and Sapporo Red Cross Blood Centers for supplying human RBCs. The following reagent was obtained through the MR4 as part of the BEI Resources Repository, NIAID, NIH: P. falciparum Dd2 strain. Leroy D, Campo B, Ding XC, Burrows JN, Cherbuin S. Defining the biology component of the drug discovery strategy for malaria eradication. Trends Parasitol 2014;30:478-90. Breman JG. Eradicating malaria. Sci Prog 2009;92(Pt 1):1-38. Shankar J, Tuteja R. UvrD helicase of Plasmodium falciparum . Gene 2008;410:223-33. Epstein D. Malaria: Failure, puzzle, challenge. Perspect Health 1999;4:2-7. Rogers WO, Sem R, Tero T, Chim P, Lim P, Muth S, et al. Failure of artesunate-mefloquine combination therapy for uncomplicated Plasmodium falciparum malaria in Southern Cambodia. Malar J 2009;8:10. Annan K, Sarpong K, Asare C, Dickson R, Amponsah K, Gyan B, et al. In vitro anti-plasmodial activity of three herbal remedies for malaria in Ghana: Adenia cissampeloides (Planch.) Harms. Termina liaivorensis A. Chev, and Elaeis guineensis Jacq. Pharmacognosy Res 2012;4:225-9.
do Carmo DF, Amaral AC, Machado M, Lopes D, Echevarria A, Rosário VE, et al. Evaluation of Antiplasmodial activity of extracts and constituents from Ampelozizyphus amazonicus . Pharmacogn Mag 2015;11 Suppl 2:S244-50. Agbodeka K, Gbekley HE, Karou SD, Anani K, Agbonon A, Tchacondo T, et al. Ethnobotanical study of medicinal plants used for the treatment of malaria in the plateau region, Togo. Pharmacognosy Res 2016;8 Suppl 1:S12-8. Ginsburg H, Deharo E. A call for using natural compounds in the development of new antimalarial treatments – An introduction. Malar J 2011;10 Suppl 1:S1. Wells TN. Natural products as starting points for future anti-malarial therapies: Going back to our roots? Malar J 2011;10 Suppl 1:S3. Barliana MI, Suradji EW, Abdulah R, Diantini A, Hatabu T, Nakajima-Shimada J, et al. Antiplasmodial properties of kaempferol-3-O-rhamnoside isolated from the leaves of Schima wallichii against chloroquine-resistant Plasmodium falciparum . Biomed Rep 2014;2:579-83. Suradji EW, Hatabu T, Kobayashi K, Yamazaki C, Abdulah R, Nakazawa M, et al. Selenium-induced apoptosis-like cell death in Plasmodium falciparum . Parasitology 2011;138:1852-62. Koshimizu K, Murakami A, Hayashi H, Ohigashi H, Subarnas A, Gurmaya KJ, et al. Biological activities of edible and medicinal plants from Indonesia and Malaysia. The Tokyo International Forum on Conservation and Sustainable Use of Tropical Bioresources. Tokyo: Japan Bioindustry Association; 1998. p. 203-8. Milton K. Nutritional characteristics of wild primate foods: Do the diets of our closest living relatives have lessons for us? Nutrition 1999;15:488-98. Subarnas A, Diantini A, Abdulah R, Zuhrotun A, Yamazaki C, Nakazawa M, et al. Antiproliferative activity of primates-consumed plants against MCF-7 human breast cancer cell lines. E3 J Med Res 2012;1:38-43. Diantini A, Subarnas A, Lestari K, Halimah E, Susilawati Y, Supriyatna, et al. Kaempferol-3-O-rhamnoside isolated from the leaves of Schima wallichii Korth. inhibits MCF-7 breast cancer cell proliferation through activation of the caspase cascade pathway. Oncol Lett 2012;3:1069-72. Halimah E, Diantini A, Destiani DP, Pradipta IS, Sastramihardja HS, Lestari K, et al. Induction of caspase cascade pathway by kaempferol-3-O-rhamnoside in LNCaP prostate cancer cell lines. Biomed Rep 2015;3:115-7. Meyer BN, Ferrigni NR, Putnam JE, Jacobsen LB, Nichols DE, McLaughlin JL. Brine shrimp: A convenient general bioassay for active plant constituents. Planta Med 1982;45:31-4. Silverstein RM, Webster FX, Kiemle DJ. Spectrometric Identification of Organic Compounds. 7th ed. New Jersey: John Wiley & Sons; 2005. Taguchi N, Hatabu T, Yamaguchi H, Suzuki M, Sato K, Kano S. Plasmodium falciparum : Selenium-induced cytotoxicity to P. falciparum . Exp Parasitol 2004;106:50-5. Hye MA, Taher MA, Ali MY, Ali MU, Zaman S. Isolation of (+)-catechin from Acacia catechu (Cutch Tree) by a convenient method. J Sci Res 2009;1:300-5. Grellier P, Sarlauskas J, Anusevicius Z, Maroziene A, Houee-Levin C, Schrevel J, et al. Antiplasmodial activity of nitroaromatic and quinoidal compounds: Redox potential vs. inhibition of erythrocyte glutathione reductase. Arch Biochem Biophys 2001;393:199-206. Sannella AR, Casini A, Gabbiani C, Messori L, Bilia AR, Vincieri FF, et al. New uses for old drugs. Auranofin, a clinically established antiarthritic metallodrug, exhibits potent antimalarial effects in vitro : Mechanistic and pharmacological implications. FEBS Lett 2008;582:844-7. Cheema HS, Prakash O, Pal A, Khan F, Bawankule DU, Darokar MP. Glabridin induces oxidative stress mediated apoptosis like cell death of malaria parasite Plasmodium falciparum . Parasitol Int 2014;63:349-58. Ansah C, Mensah KB. A review of the anticancer potential of the antimalarial herbal Cryptolepis sanguinolenta and its major alkaloid cryptolepine. Ghana Med J 2013;47:137-47. Nazre M. Historical review and notes on the correct scientific name for seashore mangosteen. Genet Resour Crop Evol 2010;57:1249-59. Nazre M, Latiff A, Clyde MM. Phylogeny relationship of locally cultivated Garcinia species with some wild relatives. Malays Appl Biol 2007;36:31-40. Al-Hazzani AA, Alshatwi AA. Catechin hydrate inhibits proliferation and mediates apoptosis of SiHa human cervical cancer cells. Food Chem Toxicol 2011;49:3281-6. Monga J, Chauhan CS, Sharma M. Chemopreventive efficacy of (+)-catechin-rich aqueous extract of Acacia catechu Willd. Heartwood against 7,12-dimethylbenz[a] anthracene-induced hepatocarcinoma in Balb/c mice. J Environ Pathol Toxicol Oncol 2012;31:313-23. Sonoda JI, Ikeda R, Baba Y, Narumi K, Kawachi A, Tomishige E, et al. Green tea catechin, epigallocatechin-3-gallate, attenuates the cell viability of human non-small-cell lung cancer A549 cells via reducing Bcl-xL expression. Exp Ther Med 2014;8:59-63. Auclair S, Milenkovic D, Besson C, Chauvet S, Gueux E, Morand C, et al. Catechin reduces atherosclerotic lesion development in apo E-deficient mice: A transcriptomic study. Atherosclerosis 2009;204:e21-7. Alshawsh MA, Mothana RA, Al-Shamahy HA, Alsllami SF, Lindequist U. Assessment of antimalarial activity against Plasmodium falciparum and phytochemical screening of some Yemeni medicinal plants. Evid Based Complement Alternat Med 2009;6:453-6. Klein EY. Antimalarial drug resistance: A review of the biology and strategies to delay emergence and spread. Int J Antimicrob Agents 2013;41:311-7. Goyal M, Alam A, Bandyopadhyay U. Redox regulation in malaria: Current concepts and pharmacotherapeutic implications. Curr Med Chem 2012;19:1475-503. Mohring F, Pretzel J, Jortzik E, Becker K. The redox systems of Plasmodium falciparum and Plasmodium vivax : Comparison, in silico analyses and inhibitor studies. Curr Med Chem 2014;21:1728-56.